Participants will be guided through our process and create 2 pieces. 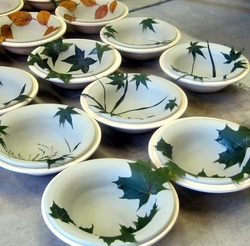 No previous experience is needed, just a desire to create a plate in the style of Kaleidoscope Pottery. Pieces will be finished and fired by Evelyn after class ends for pickup approximately 3 weeks after class. Space is limited to 6 students. Contact us for more information or about scheduling your own plate making session for 4-8 people. To get studio news and email reminders about shows, join our list. Hoping to get something specific at a show? Contact Us a full month (or two!) ahead and we'll do our best to have a selection at the show you plan to attend. It takes us 4-6 weeks to get our work through the process so help us have what you want by letting us know in advance! Please note, if you buy work at a show, prices are marked down about 25% from full retail. Buy at a show or Open Studios and save! Join Our Mailing List to receive show reminders.